Why We Are Different: We identify ways to improve your financial situation by using time proven, conservative techniques. We then develop financial recommendations and upon your approval, we implement them to help our clients put-and-keep their "financial houses" in order. 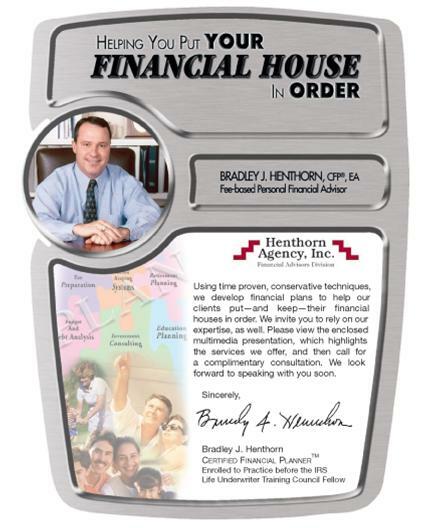 We work for clients on a flat fee retainer priced for Middle America! We specialize in comprehensive financial planning for middle income people! Our services include all of the financial areas in your life such as tax preparation & planning, budgeting & record keeping, estate planning, insurance & investment advice, into one interrelated plan that is designed to help you have a better handel on your financial goals and future. We remain available throughout the year, at no extra charge, for advice and implementation as needed from time- to- time when you have questions on anything related to personal finance! We work on a Flat-Fee basis, priced for Middle America! We are Credentialed Professionals. Our financial advisor is enrolled to practice before the IRS, and is a Certified Financial Planner® We work as part of a team with other professionals to provide you with in-depth expertise in every financial area. The professional strength of our team members is based on rigorous academic training and years of seasoned experience. We invite you to rely on our professional experience as well!